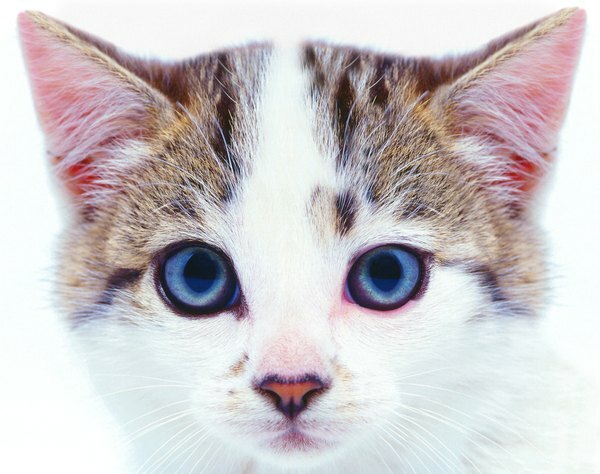 A cat's ears are independent "satellites" tuning in discreet sounds. If you've ever whistled at your cat, or blown a toy whistle, your feline might have given you a rather feisty reaction. Many cats react to whistle-blowing, for good reason: cats have superior hearing skills, and high-pitched sounds often remind them of their high-pitched prey--birds, rodents and other small animals. A cat's ear is a sensitive organ that helps with balance and hearing. The external ear is comprised of the ear flap and canal; the middle ear, the eardrum and auditory small bones; and the inner ear, semicircular canals for balance, and cochlea and the organ of hearing for hearing. Amazingly, a cat can rotate its ears separately, like two individual satellites, to pick up the minutest of sounds, helping them locate prey. If you think dogs have good hearing, cats have extraordinary aural faculties. According to Karen Commings' "Cats' Sense of Hearing," cats are able to hear sounds from 45 to 60,000 hertz, while humans can only hear from 20 to 20,000 hertz. Any sound above that upper limit (20,000) is considered "ultrasonic," which means your sedate-looking cat may really be taking in all kinds of sounds that neither you nor the dog will ever hear. The ability to hear ultrasonic sounds is what gives a cat its advantage in the wild. High-pitched sounds made by birds and small rodents, like mice and chipmunks, are easily detected by your cat's acute sense of hearing. That's why your cat may be drawn to the sound of a whistle: his instincts kick in and he seeks out what he believes is his prey. He's not really agitated--he's suddenly engaged in his environment. Sound can be used to train your cat from acting out unwanted behaviors, like jumping on the kitchen counter. Allowing the environment (rather than you) to punish the cat is called "remote correction." According to Cornell University, connect an unpleasant sound--like blowing a whistle or ringing a bell--with the behavior you want to get rid of. As your cat is about to do the unwanted behavior, startle him with the noise, and say nothing. Using sound to eliminate your cat's unwanted behavior is one thing, but there are times when noise actually can stress your kitty. Acoustic stress is caused by loud noises and especially affects felines, according to Vet Street. Fluorescent light bulbs, light dimmers, some CRT and LCD displays and tea kettles emit the types of noise likely to disturb your cat. Vet Street recommends turning these types of devices down, or playing low-volume, calming classical music. Why Do Dogs Howl When They Hear Music? 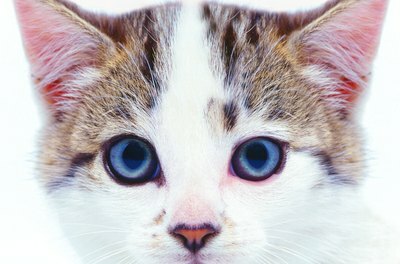 Why Do Baby Kittens Have Their Eyes Stuck Together?